Christmas cheer is spreading quickly around Hoe and Shovel while decking the halls with so much inspiration I can hardly contain my excitement. I admit some years I have to work up to pulling out all those container tubs with more sparkly bobbles than I care to think about waiting to be unwrapped and displayed. But this year was not like that. I was SO READY to get started. 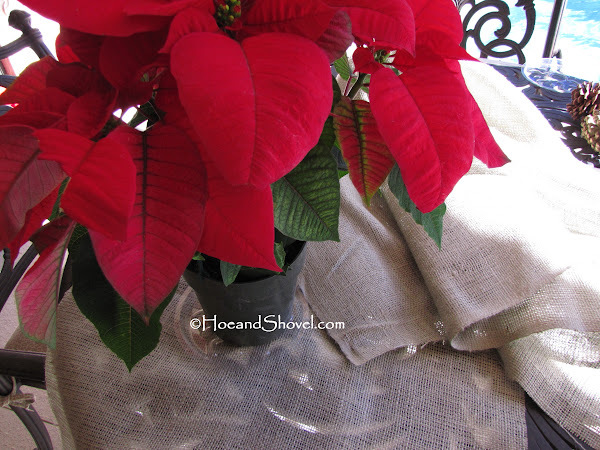 I thought I'd share with ya'll an easy way to jazz up a simple poinsettia plant and turn it into a homey and natural display for a shelf, table, or mantel. This easy-peasy idea is also a great gift for under $10. You can do this to any plant actually. I want to try it with a small cypress and a birds nest fern, too. * Plastic tray ~~ for drainage placed underneath the plant. * Ribbon ~~ 6 feet for each plant. I used a braided cord but you can use jute or ribbon or string ... whatever suits your fancy really... the possibilities are endless. * Parchment Paper ~~ optional. I used it as an extra protection from soil/water but I also wanted the extra stiffness for better form. 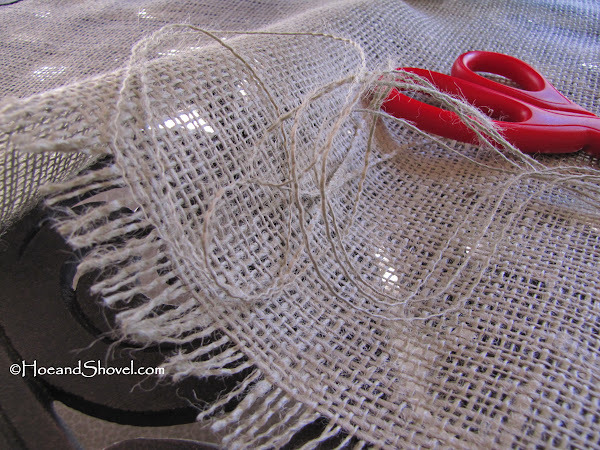 Once I cut the fabric square I pulled off a few strings on every side to create that frayed look I wanted on the edges. This is basically how it lays out. You'll need to play with the tucks and folds of the fabric once you gather it up around the base of the plant to get it even and fluffed like you want it to look. I tied a loosely, floppy bow just above the top of the pot and then let the corners of the fabric hang over kind of casual and natural-like. Did I say these make great hostess gifts? They do. The merriest of days, dear readers. I'm having a blast making my home merry and bright for Christmas... I hope you are,too. It is funny how some years I can't stand the thought of even getting the tree out and some years you better keep moving or I will put a big red bow on you. :) This is a fun easy project. 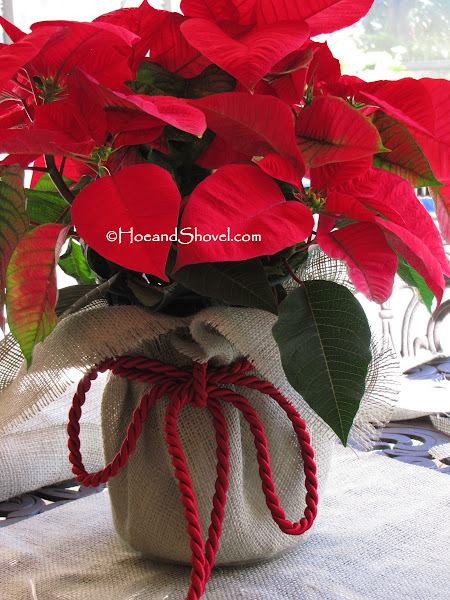 Good morning Meems ~ What a sweet way to dress up a poinsettia pot. It is very homey and old-fashioned, very nice. Have a wonderful Christmas season. That's a very beautiful gift, i wouldn't mind receiving one from Hoe and Shovel, haha. By the way did you see Rosie's styles at leavesnbloom? She made some styles also last week, also beautiful gift ideas. Wow! Now I just love that idea. 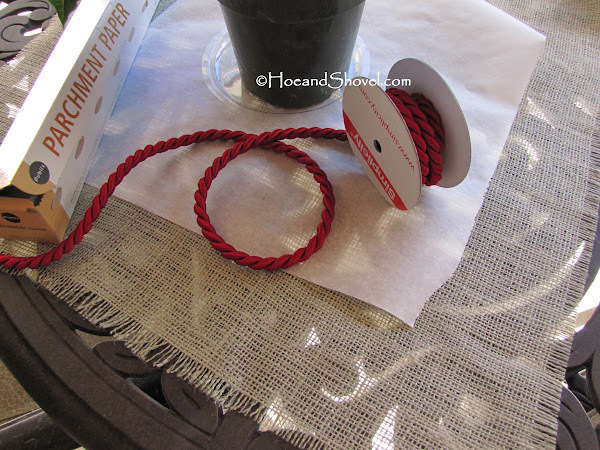 I love the burlap wrap and red cord. Just gorgeous. Thanks for sharing. Meems, you are so creative! I love this idea -- such a natural look -- and plan to try it myself this weekend. Thanks for sharing your creative energy with those of us who got shortchanged in that department. It looks wonderful and would surely be welcomed by any hostess. Glad you're in the spirit, Meems! Thanks for gift idea. I think I'll look for some Drift Roses to give. Yours sure looks lovely. I'm so glad you all found this useful. It has been fun to see the different ways to make this work. It works for any plant you want to give away. One helpful tip I forgot to mention: It is much easier to work with poinsettias that have the plastic thingie in them that helps brace them up. That thing adds some good support for your fabric and bow. Lisa... that made me LOL... my family knows what that means "you better keep moving or I will put a big red bow on you"! Loved all of the vintage ornaments...reminded me of my childhood tree!